Lovely looking watch, worth the money great value, good features, nice strong strap, nice size. Great value for Money ratio. The watch has an easy readable and clean dial, the quality of the watch itself is great. It is suitable for business casual, formal events and weekend nights out. Leather strap is good quality. Bought this watch for myself and am really pleased with it. It looks very stylish and minimalistic. The strap is quite stiff but will probably break in and the face itself is kinda fat but fits well with my large forearms. I have bought this watch for my husband for our 25th Wedding Anniversary on the 21st May. He hasnt seen it yet but I think its lovely cant wait to give it to him. Just recently purchased this product as a birthday present for a friend. Absolutely amazing, great quality for a reasonable price! It would have been nice to see a picture of the watch on a mans wrist to gauge the size before buying. The watch was larger than expected but a very lovely watch and quality and workmanship is good. My brother is happy with it. Thats the main thing! Good service, with speedy delivery. Bought it for Christmas for my partner. The watch looks absolutely beautiful and he was amazed! very happy with my purchase and worth the money! Amazing item! Fast shipping on it and worth to buy other items in this online shop! I bought this watch for my partner and he simply loved it! Very happy with my purchase, actually the second time i have purchased this watch as i soo pleased overall with the first purchase! I ordered this watch as a special gift for my father in law. It arrived within 24 hours and Im sure hes going to love it! Its a lovely watch and came with authenticity certificate as well as all of the gorgeous packaging youd expect from Armani. I still cant believe the discount on this model considering every other shop I saw it in was selling at over £130!!! Thanks watchshop, you have yourself a very happy customer! Wow! This watch is stunning in person and such good value! The leather strap fits perfectly on my boyfriends wrist which is quite wide and doesnt rub at all. The face is quite large and the silver accents make a beautiful contrast. It arrived very quickly and nicely packaged. Wow, I bought this watch for my boyfriends birthday and he absolutely loves it! He has quite wide wrists but it fits perfectly, comes in a stunning box and the face is quite big so makes a subtle but noticeable statement! The watch was a gift and the recipient was extremely satisfied with the item. It came quickly, was well packaged and looked better in real. Good quality and very happy with my purchase. Bought this for my boyfriend as a special treat while I had the money. Hes had his eye on it for ages. Its absolutely beautiful and he absolutely loves it. Says its comfortable and stylish and goes with everything. Its very classy. The watch was a present for my son he is delighted with it. Absolutely B-E-A-U-TI-FUL... boyfriend and everyone loves it. smart watch for evenings out looks good on wrist better than photo does not justify how well it looks on. Brought two of these for my sons really happy with them-real classy looking,picture does not do them justice they are much nicer in real life.Really happy with purchase would really recommend. Great purchase. Very happy with the overall quality of the product and excellent value for money. Excellent purchase...nice big face..very clear...stylish...good quality leather strap..good size...decided against link bracelet type...bought for my 19 year old son who loves it! Gorgeous, watch, super fast delivery, definitely would recommend, very happy customer. The watch looked exactly how on pictures - no scratches, in original packaging. Very satisfied with delivery as well - I ordered only couple of days before Christmas and everything arrived on time! Definitely recommend- and more than sure that I will return in the future. Excellent watch! Everything is perfect colour size model!!! All you need!!! Thank you! My partner is very pleased with the look and fit of this watch. Beautiful design, seems excellent quality. I was more than impressed by the quality of the product. Looks so much better than the picture, Has got a perfect size screen, bracelet is a great quality. Already friends told me that looks more expensive than what Ive actually spent for it. Great product, definitely happy with my gift. Thank you watch shop for your great services as ever. I always used you and I will continue doing it. watch arrived very quickly watch looks lovely. cant really review the fit as its an Xmas present for my son. Picture does not do this item justice, it looks so smart in person. Really happy with my purchase and the cost. Stunning watch, large face so every detail stands out. A watch any man would be proud to wear. Great looking watch. Nice size. Great design. Nice leather straps good fitting for all. The leather band is a great touch as it more complementary to certain clothes. This is for my Dad and I believe he will love it, a great Christmas present for a great price. A lovely watch bought for my dad. Great service - swift delivery, however flimsy delivery packaging so I was lucky the watch was still intact upon arrival! I was very pleased with this watch it was better in the flesh. Looks good value for money, Item is a gift that hasnt been given yet. Loved this, bought for my partner and he loved it. He has quite small wrists and this watch is a good fit. Its big but not overwhelming on his wrist. Very manly would definitely recommend. This watxhbis very sleek and stylish and will look good dressed up with its black leather strap. I like the black dial as it adds a bit more elegance to the watch. It has a date setting also which is very useful and a great feature on the watch. Great item, amazing value and fast delivery. Thrilled with this gift for my husband. Thank you. I bought this item as a Christmas present for my boyfriend after he saw it online.The watch is a very classic item and the black leather strap will go with all outfits, I am supprised at the great price of this watch as it looks very expensive. The date that shows on the face of the watch is a great added feature. 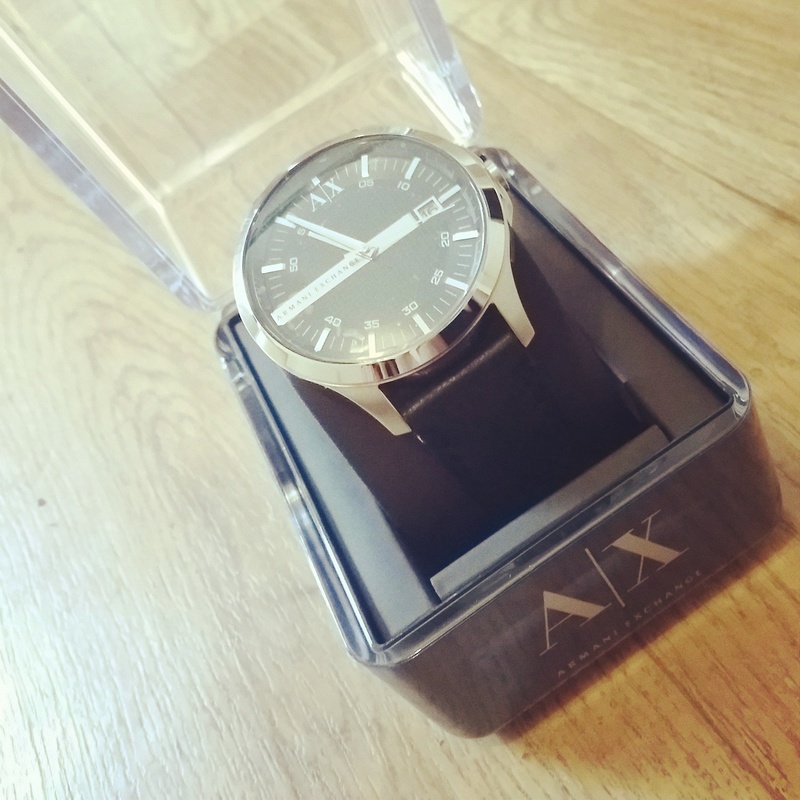 The watch is a great size and would suit all wrist sizes and shapes, if buying as a gift it is very well presented in an Armani Exchange case and box. I would highly recommend this product as a gift or even for yourself! I am looking forward to seeing my boyfriends face when he opens this on Christmas Day. Lovely classic AE Watch and value for the money. Very pleased with this watch, Pr4ice good for the product. Bought it for my son, he loves it. Love this watch! Strap feels strong and looks great. Easy to use and comes in neat box. I really cant fault this watch at all its exactly what I was looking for. Delivery was very fast also. Really like the watch! Worth every penny! Fantastic watch, quality is outstanding. The price even more so. The delivery was super quick. The watch looks and feels well built, I would highly recommend it as well as the Watch Shop. Will definitely return. Great service and a fantastic deal on the Armani watch. I was looking for a simple yet classy watch for my cousins 13th birthday and had found the same watch on 3 other sites... the Watch Shop was at least £20 cheaper than another retailer! The gift came wrapped with a message of my choice and looks perfect! The delivery also arrived bang on time! Job well done guys! I have only ever used watch shop for my watch purchases and will continue to do so! Beautiful watch, very stylish. Box a little scuffed. My grandson had liked this watch on your website so I decided to surprise him today with it for his 14th birthday. He was absolutely delighted with it and looked fabulous on. Amazing product. This is my second time shopping at watch shop and still not yet been disappointed by it. 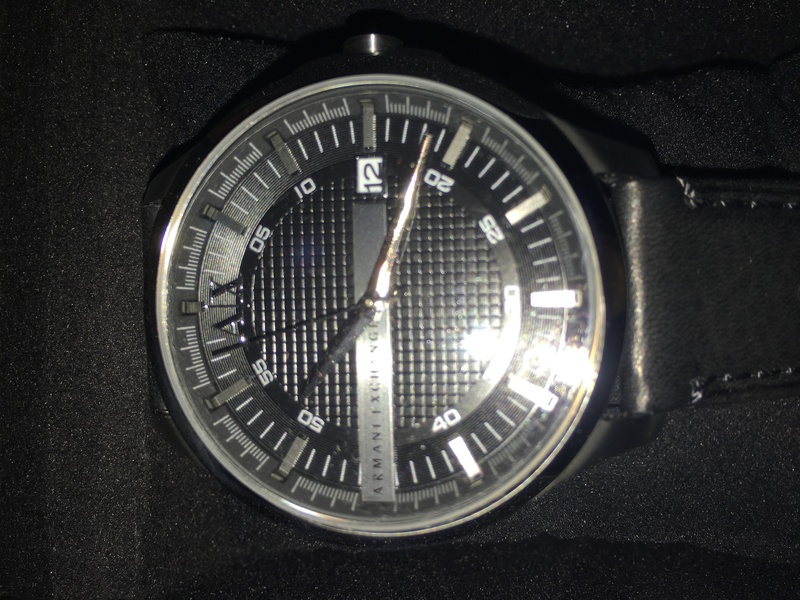 I was looking for a stylish watch but couldnt decide which to go for when this Armani watch caught my eye.\r\n\r\nWhen I first opened the box I was amazed the watch looked better in real life than the pictures. At the begining I was afraid the watch face would be a little big but after wearing it it was just fine, anyone who is unsure about the watch face being too big I wouldnt worry about it as it will just be perfect for you. The watch is really stylish , classy, simple yet detailed. Amazing price for the quality of the watch seems like I got a bargin for it! Very easy to use ,for example changing the date and time,and easy to read the time even when dark. the shiny metal surrounding the watch stands out in a nice way. Its very comfortable on the wrist but can get a little sore after a long while. \\\\\\\\\\\\\\\\r\\\\\\\\\\\\\\\\n\\\\\\\\\\\\\\\\r\\\\\\\\\\\\\\\\nWhen I first wore it out, I received some very positive complements . Very happy with this watch. My only concern is that the leather strap can be a little stiff and hard sometimes and creases very easily but not that bothered about it . \\\\\\\\\\\\\\\\r\\\\\\\\\\\\\\\\n\\\\\\\\\\\\\\\\r\\\\\\\\\\\\\\\\nOverall I love everything about this watch and highly recommend this watch to anyone. Another great job from watch shop again. Bought this as a gift to my Husband. It looks much better in real . My husband loved the watch.. I recommend this without a second thought! Excellent product. does exactly what it says on the tin. My son whom it was bought for is over the moon with it. Looks fantastic as a traditional gents watch. 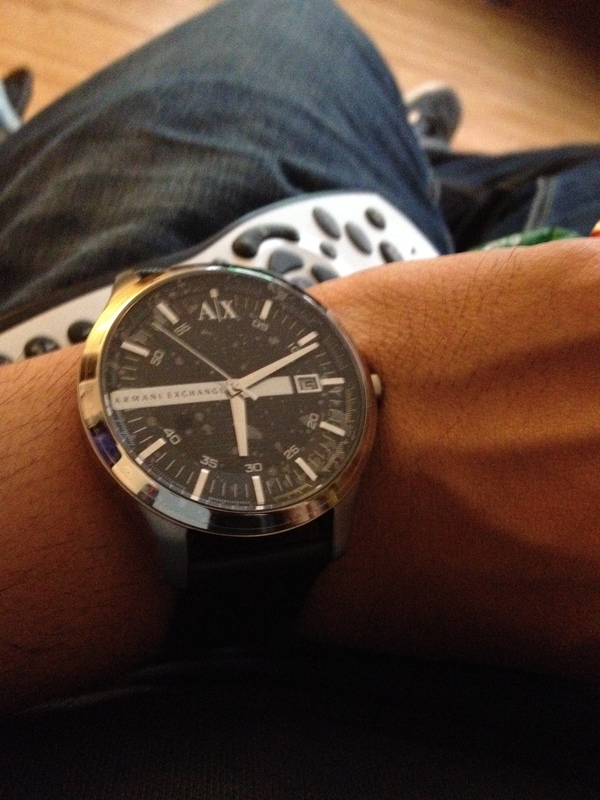 I bought this lovely Armani watch for my sons birthday which is in early September. I bought it early as the watch had a reduction on the price and I didnt want to miss out. Watch Shop always provide brilliant customer service, from the tracking of delivery, to the packaging of their watches and to the excellent delivery service. I cant give a picture of this watch as Im 71 years of age and dont have a lot of IT expertise. Lovely watch, comfortable fit and the face is remarkably clear. It gets very hot in the heat though but great product all round. Husband absolutely loved it great size and comfy strap, looks fantastic. Absolutely loved this watch, cant wait to give it to my boyfriend. The pictures do not give it justice. It arrived in perfect condition on the day of the expected delivery date. There was no damage on the product and it was identical to what I had ordered online.I would recommend people to buy this product. A great looking watch which my son received as part of his birthday. He was chuffed to bits ! Great watch bought for my younger brother and he loved it. - and with the Watchshop offers - makes it easy on the wallet as well ! Excellent buy again from Watchshop. Fantastic product at a fantastic price. Watchshop never disappoints. Brother loved his gift came in great condition and just as described. Fantastic way perfect size for my wrist. Stunning features and works well with all clothing items. When I first saw this watch on the day it was delivered I was amazed, the whole sensation of wearing the watch was absolutely top notch couldnt of been any better, the leather strap is so soft on the skin and doesnt make those irritating rashes you get from other watches. I just knew that this was the watch for me and its been a blessing, had it over a week and only take it off when Im in the shower and its never let me down not one bit. 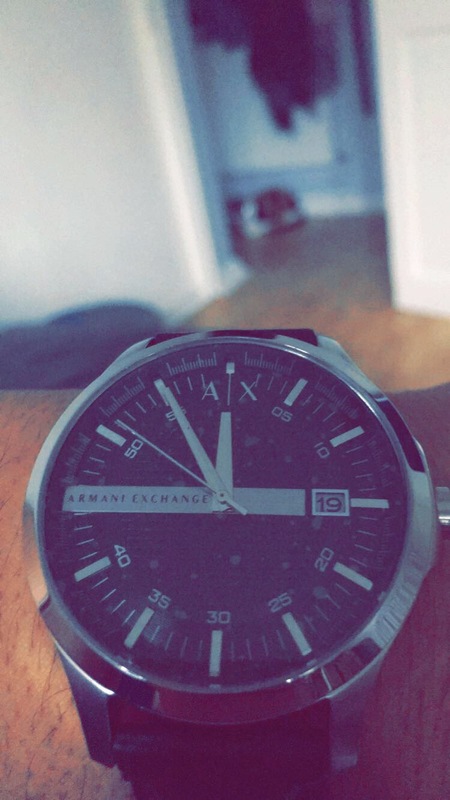 I was so happy that I bought the Armani Exchange brand because theyre was nothing quite like it. I would thoroughly recommend this product to anyone, its stylish, practical and very easy to wear. Excellent watch same as seen. However bit of the treads is coming lose. Only wore the once. Lovely watch however the strap rubs and looked scratched after worn once. Its a very classic watch but stylish, it looks amazing whilst wearing and im amazed with this purchase as i didnt think it would be as great as it is. I would recomend this to others. Beautiful watch, wasnt impressed with the box the watch came in. Bought this for my boyfriend for valentines day but gave him it early, he absolutely loves it wants to wear it all the time! This is the best watch you can ever purchase for the price. The quality and detail of this is absolutely stunning and is such a luxurious wrist-item. 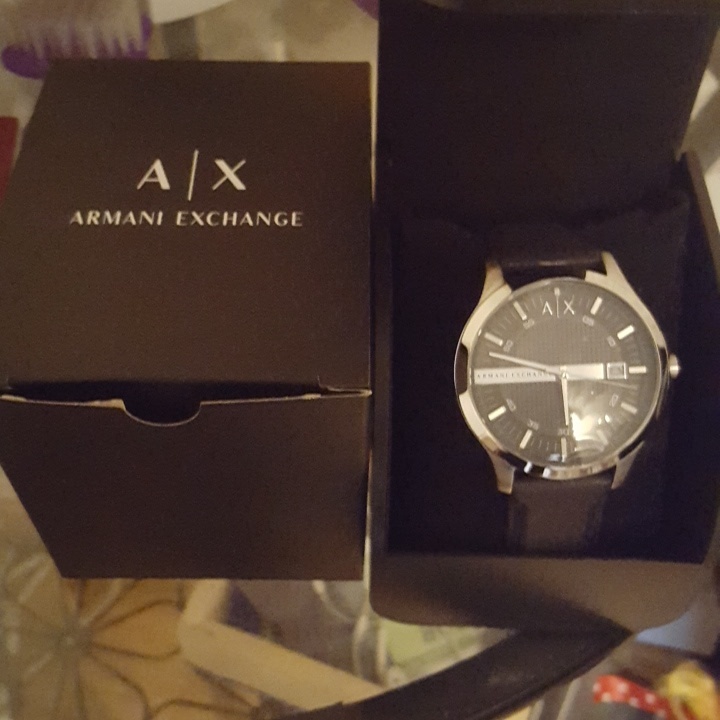 Armani Exchange have done a great job but Watch Shop has done an even better job by delivering this product with such care. This was a great purchase and i am more than happy with everything that it came with! We brought this for a good friends Birthday/Christmas present. Delivery was brilliant - literally turned up as promised the next day. Watch was presented well and was of solid design and a good weight and was as expected from this brand. Bought it for a gift so didnt see it yet as it came with a great gift box. Really quick delivery. Received my watch fast and it more than I imagined it to be. Im very happy. Really like the watch, looks a lot better in person, lovely big face. Does exactly what it says on the tin, great watch, delivered when they said they would, love my watches so will definitely be using Watchshop again and also telling friends and family about them, happy days from ordering to on my wrist! Regarding the product arrival. 5 star, and the watch looks very classy.. A good watch to give as a present. Super fast delivery, Exactly as pictured. Only ordered this yesterday as a Christmas present for my boyfriend and it arrived today. Nice statement watch, Not too big and in your face. Great value for money. Now to wait for Christmas day and hope he likes it as much as I do which im sure he will. Thank You Watchshop. Bought as a gift, they loved it! Even better looking in real life. Beautiful quality. So worth the money!! Such a lovely watch, bought for my boyfriend for Christmas very impressed when it arrived! Smart and very worth the money. Lovely leather strap, will be deffinitely using watch shop again! Great watch at a great price! Perfect for a 9-5 watch! I cant review its an Xmas gift for my hubby so he wont see it til Xmas day, but it did look great. The watch was exactly what I wanted the service was exceptional, I was kept informed at all times about the progress of my order. I would definiteley use and recommend again. Watch looks fab, bought as a present so hoping it will look good on. Half the price in certain shops, so great value. I have ordered this watch for my other half. The watch is very attractive, was good value for money and also is a very good fit due to the number of size wholes on the strap. The watch is of high quality and looks very smart. Brought this watch for my Dad, looks amazing. Such a great price for the brand that it was. Definitely would recommend. Very pleased with the look of the watch it is for a gift for my son at Christmas. The watch was exactly how it looked like on the page. Authentic product delivered on time and a very good deal as well. Difficult to find the same product at a lesser pricr anywhere else. I bought this watch for my boyfriends 17th birthday and couldnt be more pleased with it. The price was so reasonable and it came within 3 days of me ordering. It. I was worried at first that the face would be too big however he now wears it everyday and loves it! 10/10 would reccomend to anyone... The full packaging makes it a really special present for anyone who buys. Bit skeptical at first by buying a watch online something Ive never done before. But after saying that, just pure class, delivered in two days, in perfect condition, looks better then it does in the pictures, and I wear it everyday and it still looks pretty much the exact same besides normal wear and tear you would expect. Couldnt recommend this website or the watch enough. Great quality product at a good price! Very nice watch. Its comfortable and looks good and is suitable for all occasions. Much better quality than i expected, definitely recommend! This is a smart, modern, business style watch that looks elegant and impressive. The leather strap is good quality and the only possible negative is that at 47mm diameter it is very large on the wrist. Personally I like that but it may be too large for some people. Excellent value for money. Extremely fast delivery. Thank you. I was extremely pleased with the service I received and the delivery of my purchase was very prompt. The packaging also was of a high standard which made this gift look extra special and for my Sons 16th Birthday he was extremely pleased. I bought this watch for my nephew as a gift for getting excellent grades. Hes 16 and got 5 A and 4 As. Hes never worn a watch and i told him if he gets good grades Ill buy his first watch. He was more than happy when i gave him his gift. He loved it and put it on straight away. It was in excellent quality and i will be buying from watchshop again. Really pleased with my watch. Great communication and fast delivery. Would definitely recommend. When receive a purchase,I was very surprised.Looks fantastic,soft leather strap with wrist watches Initials,great design.I am very glad to have this watch,and a great price!!! Also, I recommend that you buy this watch,will not regret!!!!! I was really impressed by the watch and the delivery. I wasnt expecting the watch to be as big as it was but it really was bargain! The delivery was prompt however I didnt get a dispatched emails so I wasnt sure when I was going to get it, communication was a bit off but I did however get it first thing the very next day! I was surprised by the delivery.It had stated that the goods will arrive 9:00 AM,but arrived 7:50 AM.Packaging very carefully thought out.And finally , excellent quality watch.I am very enthusiastic,Also I recommend buy this product!!! Very nice watch. Not too heavy considering the size of the face. Received for a birthday present and feel that it is great value. 5 service..fast delivery..affordable price plus the 5£ voucher makes it even more better and worth it...i really like my watch and i will definetely buy from watchshop again thank you.. Excellent watch, stylish. great for any ocassion. Brought this watch for my husbands birthday and he loves it. Super fast delivery, well packaged. I think this watch got it all, its cheap and made by a very amazing manufacturer. This is an amazing watch looks really rich. Worth spending money. Great looking watch, impeccably designed and feels great to wear is quite large though . Goes well with formal / casual clothes and attracts plenty of compliments. Bought this for a present for my boyfriend, was really impressed when it came! Looks even better than the photo. Definitely worth the money! Absolutely love the watch! It is very stylish, with a very large dial. 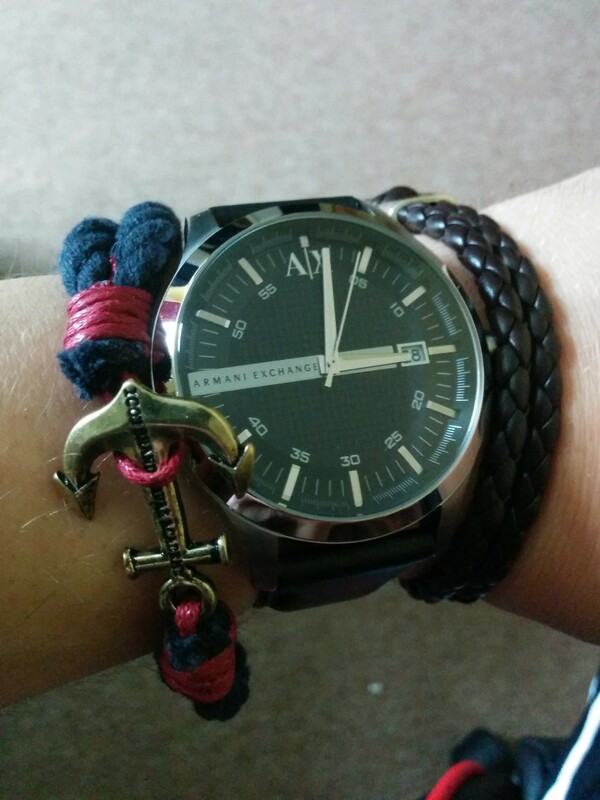 Having recently looked for other Armani-brand watches, I have to say this one was also very reasonably priced. My order arrived in just a few days, it was beautifully packaged, and the watch itself is simply impeccable. Beautiful watch, looks nice and clean, came on time in good condition. As I am skinny fits skinny wrists perfectly. Fabulous watch looks really expensive and the quality is very good for the money I paid. Was bought for a present for my husband who doesnt really like metal scraps as they react with his skin so this black leather strap is great. The face is also black and has the make on the dial in the silver which is a very nice touch The box that it comes with is very nice and has the instructions inside to work the watch watch is fantastic. All together love this product and so does my husband. Excellent watch and looks exactly as the picture on website. Very much worth its price. The reason I bought this watch was purely on its design and the way it looks on my hand. Its looks sofisticated and still very elegant. Lots of choice on the website to choose from all at good prices and competitive with other sites. Very nice watch,good value too. When my son wore it looked even better. The size was just right too. I bought it for my sons 16th birthday. He sad by far this was the best present he has ever had. Im so glad l made the right choice in buying this watch. Very fashionable watch bought for my son,looked and matched the description perfectly. Nice big modern face chunky effect,quality strap and fits great. Chose black dial as i felt it represented the sryle best. The watch was bought for my teenage son who was delighted with its contemporary design and overall appearance. Initial impressions are that the watch is a genuine high quality product and good value for the money. I was really unsure about buying this watch because I have very skinny wrists. I usually struggle to find a watch that fits and looks good. This watch is great! Ive got the strap done up on the last hole so its on the smallest setting and it fits nicely with a little room to spare. My other worry was how big the watch itself was but now Ive got it I can tell you it looks great on a skinny wrist. Dont be put off by the size. If the only thing stopping you buying this watch is the the fact that you have skinny wrists then dont worry. Go for it, you wont be disappointed. As for the watch itself, it looks really nice. As some of the other reviews have said, it does look and feel like an expensive watch and it really stands out when it catches the light. Its just the right weight. You can feel it but its not dragging your arm down. The strap is very comfortable too and even though I am using the last hole there isnt any excess sticking out at the end. Its all where it should be. The presentation box is pretty nicely made also. Overall I am really happy with my purchase. To me £90 is not money I can afford to throw away on a whim so I had to really think about making this purchase and Im glad I did. I hope this watch will last me for a long time now. I love it. Summary: Looks good in small wrists, fits well on small wrists and is a cracking watch. Go for it! nice exact like I see on picture. everything was ok. thank you. i am gona used this site again if i need something else. Very attractive watch, much nicer than in the actual photograph. When ordering, had initial doubts about the black face, but doubts were dispelled when I opened the box. There is also a clear face. Impressive quality for the price. Its weight was also pleasing. At the moment, I cant think of anything negative about this article. Fantastic value. The watch is one of the cheapest but also one of my most loved watch, it is simple, very beautiful design, fits perfectly, has some weight to it which for me is a positive thing. The strap is comfortable and obviously can fit anyone. The only bad thing is setting up the day. It always goes from 1-31, so you will have to manually set it sometimes but it is not a major problem. The product was great value for money purchased for 89.99 for boyfriend and when received in the post it looks as if it should cost a lot more. Nice size, good quality black leather strap. The style of the watch is simple yet very stylish and professional looking, would be nice as an everyday watch as well as going out. Im usually very skeptical about buying products over the internet as its not there for me to personally evaluate whether its worth it but this item definitely is. I would recommend this watch to everybody,very good ideal for a gift. I bought this for my boyfriends birthday and I can say it did not disappoint. He hasnt opened it yet as its next month but the watch itself is gorgeous. Lovely leather strap and the face looks so smart. I agree with all the positive reviews posted on here. Great value for money. Great watch, nice fitting too it, looks good and not too big but just the right size. The leather strap is a bit rigid though, but not too much trouble. Got this for my dad he liked it a lot. Was looking something simple and sober this matched perfectly. The item is everything I expected, and I am very satisfied with my purchase from Watchshop. It suits everything I expected, from when I purchased it initially to this day now. I bought this watch for my boyfriend hes 21 for the Christmas just passed. Once I received the item I was more than pleased with it. Both its packaging and presentation. I took time in choosing the perfect watch for him as I wanted it to be something classy and smart yet wearable on a day to day basis. The watch is designed elegantly yet doesnt look overly fancy which was exactly what I wanted, . You can dress it up or down which is perfect for my boyfriend. The watch face is a decent size, large but not in your face huge. It is also extremely clear and the detail is something you notice straight away. It is a perfect man size watch. He was just as satisfied with wearing it as I was with buying it. Its a great present for any man in your life as I feel like it is a timeless watch. I am so satisfied with this watch and I highly recommend it. The product overall is perfect the watch face itself is rather large which matches the thick leather watch strap. The product is simplistic yet sophisticated, due to it being entirely traditional. I would definetley buy this product again. It was a lovely gift. Fanstatic lightning like delivery, even during this busy festive period. Watch bought for present looks amazing. Money well spent. This is such a nice watch and for the price its amazing! The leather feel very premium and comfortable. The dial is very shiny and looks awesome, perfect for any occasion! If youre worried it might be too big, dont! I have very small wrists and this fits perfectly! Lots of compliments about it! Great service from Watch Shop as the item arrived perfectly on time and was packaged excellently. Very impressed! I bought this for my Boyfriends 18th cant wait til he sees it! In Love! Gorgeous black leather strap detail with a big face perfect for the wrist and is a huge statement watch that can dress any outfit up! Perfect for practical work and perfect for a night out! Not a fuss over link as the strap can fit any size: over all really pleased!!!!! Excellent service with very fast delivery. The watch is very nice and great value for money. Would recommend this product. Excellent service and lovely looking watch. It makes an excellent Christmas present. So so so happy with this watch. It was a fast delivery got it with in 42 hours of ordering. The case and box that the watch came in was just the cherry on the top. It really is an ideal present! 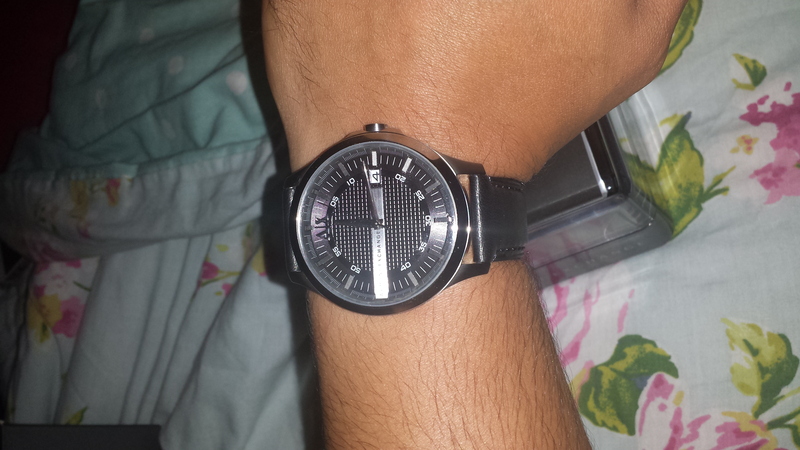 Couldnt be happier, for the price I paid im extremely happy with the watch its self. Wasnt too keen on it when ordering online especially so close to Christmas, I was also stuck on which watch to buy for my boyfriend for a main Christmas present.. But I kept looking at the popularity watches and it kept catching my eye, its made me one very happy customer and I certainly know where to come if I ever need to buy a watch again, so Id happily recommend this to anyone. Absolutely perfect ! Having not been able to see this watch in person I was pleasantly suprised ! The watch appears to be very sturdy and manly looking. I really love the quality and colour of the watch. Overall it looks very expensive and the finish of the watch is of a high standard. 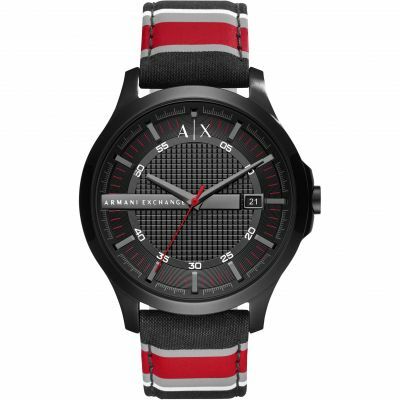 The watch face is large but with great detail on it that ties in with the Armani Exchange brand image. The watch looks more expensive than it actually is and I believe that you get a very high quality watch for a small price. This will make a brilliant Christmas present for my boyfriend. Definitely worth every pound spent! Absolutely perfect ! Having not been able to look at this watch in person I was pleased beyond expectation. The watch is a very sturdy manly watch, with genuine leather straps and a very large durable watch face. I love the colours and style of the watch. The watch overall looks a lot more expensive than it actually is and I believe that you get a lot more than what you pay for ! 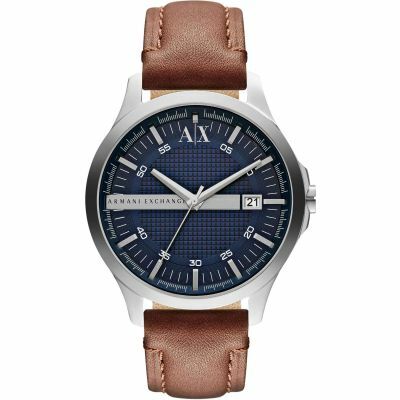 The detail on the watch face is very stylish and modern and fits in with the Armani Exchange brand image. I am also very impressed with the packaging the watch comes in. This will make a great Christmas present for my boyfriend. Worth every pound spent ! I feel like the item itself looks really smart, the item was a present, and the look is extremely stylish. However I feel like the button you use to change the time and the date is extremely stiff, and the instructions are not clear in how to change the date, and we ended up having to change the date by going through the times so having to change the time through passing the 12 oclock twice, for a date to be changed, which I felt was highly annoying. And the clock face is easy to read, without being too big. was looking at this item for a few weeks before deciding to purchase. once i did and the item arrived i was very pleased with it. large enough clock face, easy to see. excellent product all round. 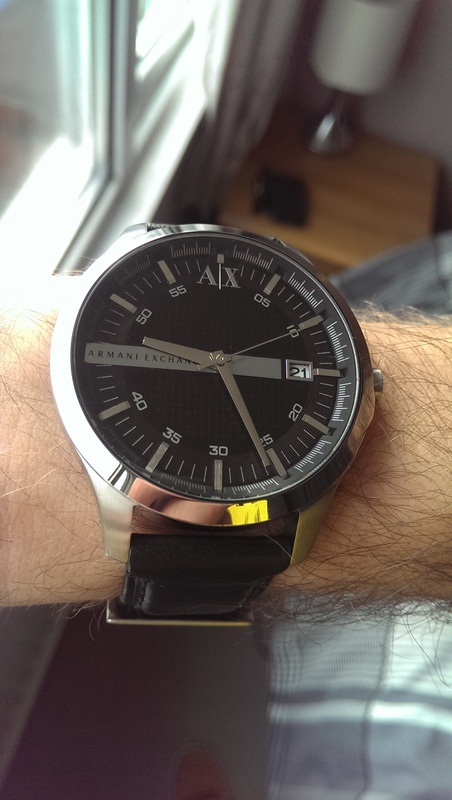 The Armani exchange watch is fantastic and worth the price. Although the only mishap would be that the dial if fairly big, I have very skinny wrists but I can still deal with the fact that the watches dial is quite big. I think the watch is a great quality watch with fantastic detail. Also, the watch is powered by winding it, therefore it is almost guaranteed never to run out. excellent watch. Case shape and size is ideal. Black leather strap is comfortable and attractive. I was gobsmacked when I opened the parcel the day after I had bought it!!! It looks so expensive and smart. Bought for my boyfriends birthday and he is yet to open it however I feel I am more excited about his birthday than he is as I cant wait to see his face when he sees this gorgeous watch! All features are identical to that in the photos, if not better. Makes an overall brilliant present!!! Unboxing: Original box, certificate of authenticity, instruction/warranty booklet and finally, the Watch itself! Delivery time: 15 days as mentioned and estimated on watchshops website. I have to admit that I am very impressed with the product as well as the service offered by watchshop. The selected item was exactly the same chosen on the website and with no doubts the watch is not a fake one! I was worrying about the delivery time due to international shipping but finally was just surprised as the estimated time was respected and received my watch very fastly. The watch was for my son and he was delighted, the face is quite large which is what he wanted and the strap was a good fit although he has largish wrists. The strap is also comfortable, being leather rather than metal. The face looks just like the picture and is nice and clear. altogether is looks like a modern classic. Quick service. Excellent product. This is the third watch Ive brought from you for my sons 21st birthdays . Ive always been pleased with the service and the watches Ive brought . I will buy from you again. Thank you. 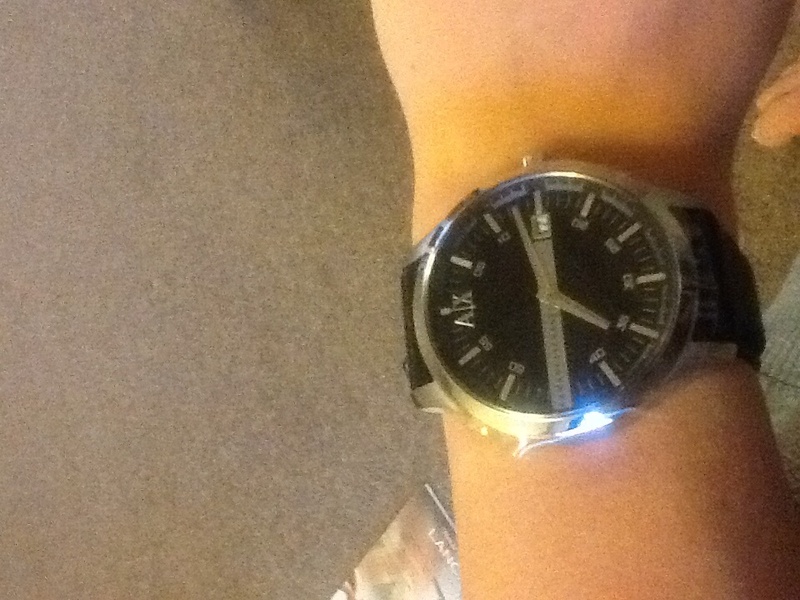 Baught the watch for my dad who avsolutley loves it! Quality is fantastic and feels very snug on any wrist whilst the look is very universal so that you can wear it with multiple different clothing styles. the product was amazing and the person who i bought it for loved it. The watch fits well and is very practical. excellent watch, fantastic service. Brillianr site. Ordered the watch on Tuesday afternoon, delivered Wednesday morning. Bought this a gift for my brother in law. Love the quality and design. Great value for money. Would recommend to everyone ! I like a design of the watch I ve bought. It was exactly what the person I ve bought it for has expected - modern design, colour, brand and first of all quality of the item. It was the perfect gift and it was highly appreciated. Everything as advertised, great comfortable, classy watch with a large dial, exactly what I was after, would recommend. Very good watch, and the service was fantastic, nice price for a very good watch, must buy! Very nice watch at a very reasonable price. Bought as a present for my son. It has quite a large face, but I think this just make it a bit more trendy for him. For me, the most important thing about a watch is that I should be able to read the time quickly, easily and accurately. this watch is the best I have ever had in meeting this requirement.In addition to this it looks good on the wrist and is good value for money. For more formal occasions . I am very happy with my purchase and the service provided . Good Job Watchshop. This is my first purchase online from Watchshop and I am so pleased with it. I opted for the next day delivery and I got it by 11 PM next day for free in Original Armani Packing with the warranty.. The watch is awesome. I have purchased it to gift it to my Dad and I am sure he is going to love it too.. Once again Great Job..!! Value for money its affordable and look good stylist for any age. The leather belt makes it look unique and its also stainless steel which means I dont have to worry about when wearing at work. The watch was bought as a birthday present for myself. The watch arrived very quickly and i was provided with regular updates via email. The watch was presented in a very stylish box and comes with a certificate of authentication. The watch face is a little larger than in the picture but i prefer large face watches so i loved this feature. There is also very fine detail and inscriptions on the back of the watch and the leather strap as well as in the face itself. The watch is also reasonably priced compared to other watches. Ive no words to explain. Good watch nice to have on your wrist. Value for money. If you are planning to gift a watch its really one of the best option you have. Bought this watch a couple of weeks ago. its a very nice watch to wear. Its not too heavy or too light its just right. The leather strap is a little too stiff at first which makes it difficult to put on and take off. Overall a very nice watch for the price. The watch was exactly what described on the website and actually surpassed my expectations, with it looking much better than I actually had expected. The fit of the watch was great, however it can get sore if worn too tight for long periods of time. Great watch. Looks amazing and luxurious. Worth for a little money. 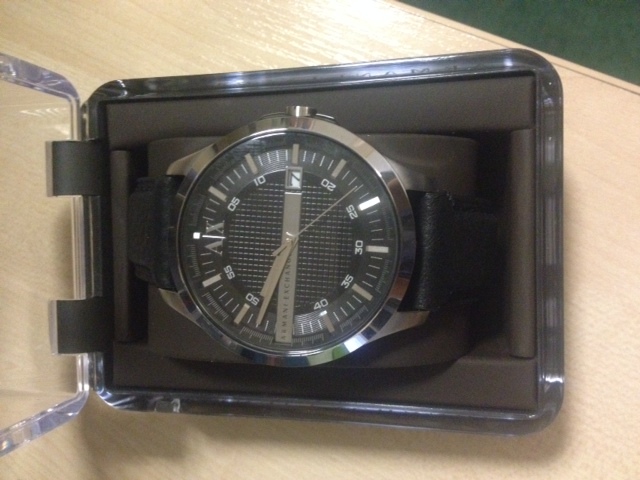 Fantastic quality watch, fits really well and the service from watchshop was great. superb delivery on time. This watch arrived last week and initially I was very pleased with it, however after wearing it for a week the band that holds the end of the strap snapped and I am returning the watch for a refund. Very happy! Great gift for 15 year old boy. Like watchs style, date facility, leather strap, ease of use and quality. I really love this item!! A fantastic watch for a great price!! It looks exactly as it did on the website and is a perfect fit. Its a truly striking design with the black face complimented by the stainless steel silver. The black leather strap is ideal for the design and it you cant be bothered to deal with a bracelet type watch and fitting issues, this is a brilliant alternative. The AX markings are beautifully done, put in the right places and not at all overbearing. This watch also comes with a date feature which is an excellent touch. All in all a beautiful watch, with a sleek and stylish design at a great price. Very happy with my purchase!! Fantastic watch. Although it looks great in the pictures, its even better when received. A real feel of quality, smart enough for work and formal events, but also perfect for everyday wearing. The leather strap is the sturdiest of any watch I have ever had. Quality watch, far better than more expensive watches I have purchased in the past. Great price, fast delivery. Highly recommended. I purchased this watch as a last minute birthday present and was surprised that it got here so quickly, I ordered the watch Sunday night and it was here by Tuesday morning. It was well packaged and comes in a nice glass box. The watch has a very simple style, but it looks a lot more expensive than it was. It also comes with a certificate of authentication and instruction booklet. The face of the watch is bigger than I thought it would be, but thats not a problem. The face also has a lot more detailing than you can see on the internet, but it does look very nice. Overall, Im very pleased with the purchase. I bought this watch as a birthday present for my husband and he absolutely loves it! It looks really good on, its very classy, he can wear it at work with a suit, but it goes with a casual outfit as well. Its a very good quality product, especially given the price, its quite a steal! Im very happy with my purchase! 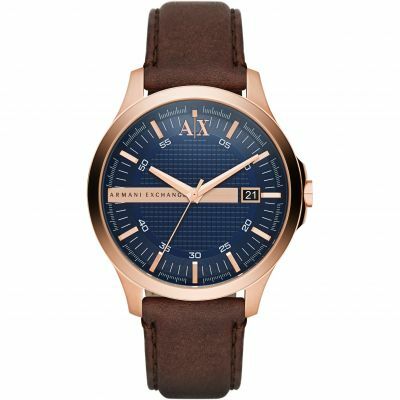 The Mens Armani Exchange Hampton watch is a perfect gift for any male. 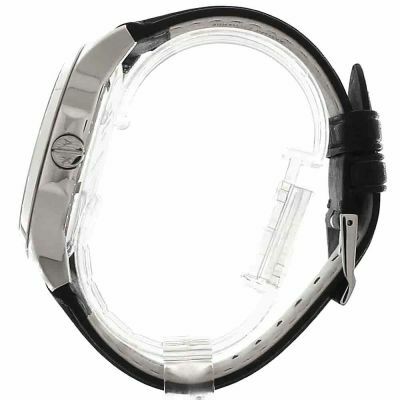 It has a smooth black leather belt which compliments the silver outer lining of the watch. The stainless steel gives a brilliant commendation to the dusky black dial. The hands of the dial fit perfectly with the design shades of black and silver. The watch itself describes the man to be wearing it as a mysterious, Bond type. As well as the outstanding look, it is also a tremendous fit and extremely comfortable. 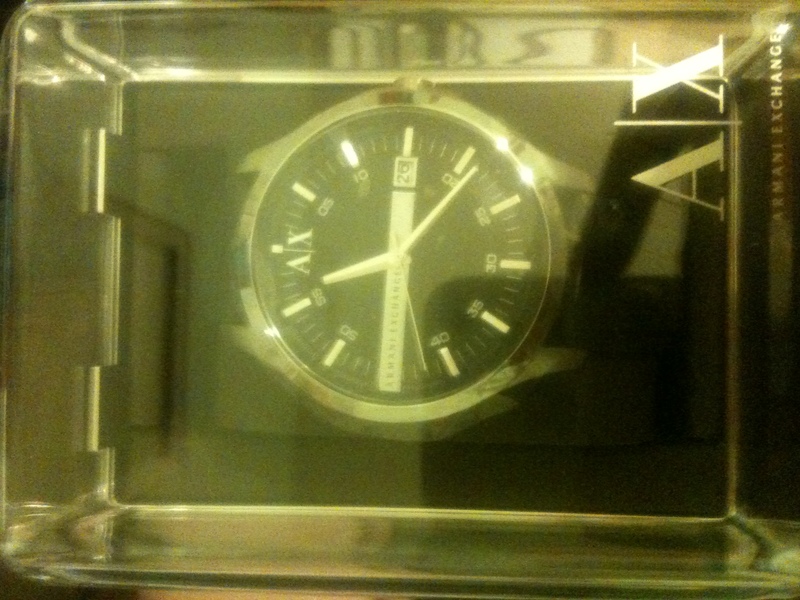 The Armani Exchange watch I bought is absolutely fantastic. It looks better in the flesh than it does on the website. It fits comfortably also. Everything about it is perfect for me. I have small wrists, but my watch still fits me perfectly. I would encourage many to buy this watch, because it is simply good value for money. Excellent product in very good packaging. Great birthday gift. It fits really well and looks very classy. This watch makes a lovely gift. Its stylish yet simple. Looks smart and water proof. What can I say, the watch just looks incredible. Every finest bit of detail looks exceptional. The black looks rich and the silver finish compliments it so well. 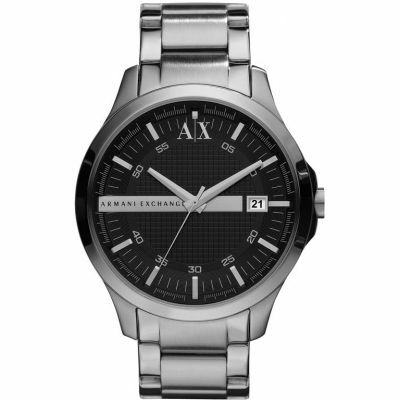 The Armani Exchange brand new stamped on the inside of the watch adds the perfect finish. Honestly, I did not want a chunky, over-sized watch. This was exactly the right size I was after as I have quite a small wrist. It definitely compliments a suit and tie! Excellent item. Much better than on the pictures. I am really satisfied and did not regret to buy this watch. I received the watch very quick, I brought the watch for my husband who loves it, it was larger than I expected but it really is lovely. Exactly what I needed, lovely large face design and very comfortable leather strap! watch is stunning and elegant. gives and smart look, can be worn with a casual outfit or even with smart wear. 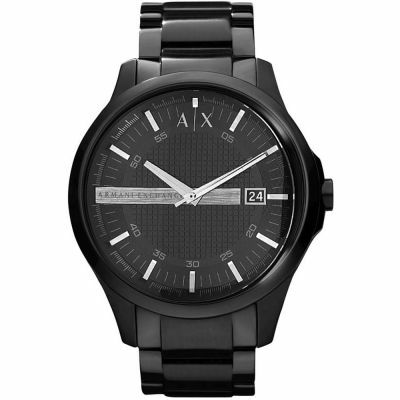 armani exchange mens watch, black leather strap. I really love this watch, not only is it great value for money for a great name, it looks incredible when on! I bought as a gift for my friend but I want one for myself and I couldnt resist trying it on. The leather strap is really classy and shows off the watch face. Most people think that the watch faces on Armani watches are really big, but I have very small wrists and think it fits and looks great. The watch is very nice and stylish. I bought it as a gift for my dads 60th and he was really pleased with it. The face is slightly larger than your average watch which is good and the hands are clearly visible which I think sometimes is an issue with other watches. Loved this produt, got this for a special birthday for my bother who equally loves it. Great size - nice and chunky and comes in a variety or face colours - I went for black but liked the white too. Also loved the packing, nice box to top it off!! It was easy to place order. they kept notifying me about the delivery of my watch. It came on time and packaging was really nice. When I open the box I was so impressed as the watch looked stunning. I found the head of watch a bit large for my skinny wrist. But the srap was adjusted as I said and it fitted tightly around my wrist. Overall My expectation was met and I am happy I purchased my first watch from WATCH SHOP. Perfect, comfortable fit. Bold and stands out, eye catching watch. Black leather strap sets off the look nicely. Very pleased. Bought it as a gift for someone but would luv to buy 1 for myself as well.this watch is very stylish and durable.good value for money. The product received is exactly the same as seen on the website. Well packaged and fast delivery. Well impressed with the service provided! I bought this watch for my son, he is really pleased with the design of the watch, he states its is comfortable, stylist, modern and different to his other friend watches. I bought this watch for my husband, he really love it. Easy to set time/date the color goes with anything he wants to wear. Its one of the best watches so far. Excellent service from start to end. I was very reluctant at first but needed the present for my sons birthday-arrived early and he was really happy with the watch. Thank you you made my life easier. Excellent value for money and the picture does not do this watch justice. Very happy with purchase. Watch brought for my son, who absolutely loves it, good choice, happy Christmas! 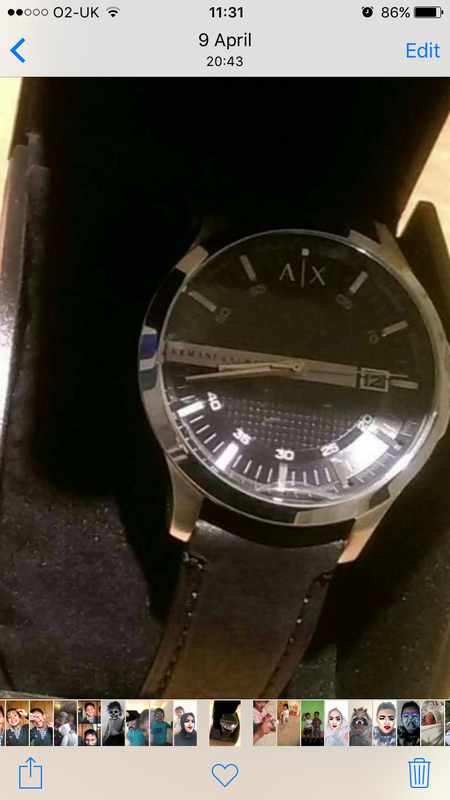 I bought this black Armani exchange mens watch for my husband for christmas,I was surprised when I saw the watch because it actually looks better than the image in the website,the box it came in was awesome too,very very impressed,Im sure my hubby will love it when he sees it on Christmas Day. Fantastic, really happy and the price was amazing. It looks better than the pic. The watch is beautiful. I cant wait to see my partners face when he opens it. The watch looks very trendy. Great and fast delivery. I would recommend this watch. Product is very good for value. i would recommend to anybody. Big face which is really nice makes it stand out when wearing it. 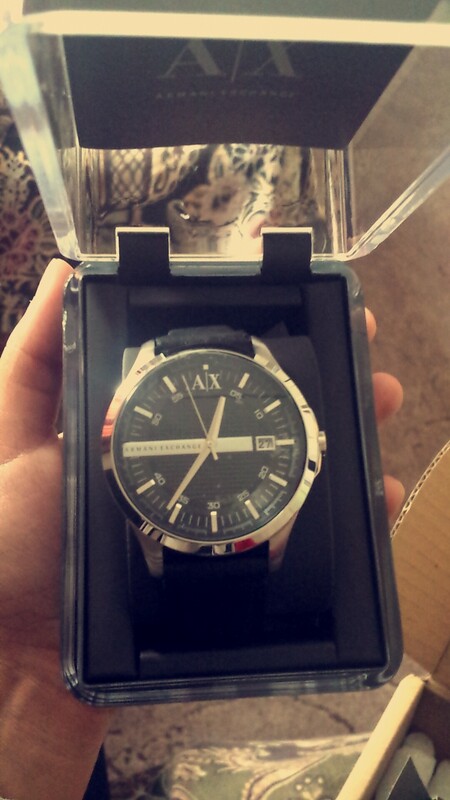 I purchased the Armani exchange watch 2 days ago and I received it this morning! Super fast service and delivery! Couldnt be more impressed! However, I was even more impressed when I discovered what was in the delivery bag! The box was secured with a tamper evident label which I have never come across before on delivery of goods, however I think its fab idea. My neighbour kindly signed for my package as I was out, and if you are not familiar with your neighbours, they might have a sneaky look themselves, so this makes it virtually impossible to do so without you finding out. Inside the box the watch was covered with polyester pieces to keep it damage free. The casing of the watch is sleek and simple and you can see the watch through the case! The watch its self is lovely, its really classy and can be worn for whatever occasion. I deliberated for a while about purchasing this watch, as the price was kind of telling me it would be cheap and maybe not quite what I was looking for however its quite the opposite, it looks like Ive paid 3 times the price. The leather strap is of good quality and the watch its self just radiates style! Im so impressed with this purchase, I cannot wait to give it to my boyfriend for Christmas! I may even purchase another for my father! 11/10 really impressed! This is a best seller for a reason. If you are looking for something special, without the price tag, this is it by far. absolutely brilliant value for a class watch, bought for a Christmas present for my son. A very beautiful and classy watch, I especially liked the big size and the silver detail made it look even more awesome and expensive. I would definately recommend it as it would suit any one regardless of age and to top it all, WONDERFUL price tag. My husband has gotten loads of compliments. I dont regret buying it for his birthday. Money well spent. Love this watch! given to my brother as a present and he loved it, great value for money considering the price for Armani, bargain again with the watchshop. Looks exactly as shown in the picture and nicely packaged. One more order delivered with fantastic service. Excellent product, price and delivery. Looks really good on. Large easily readible display. My boyfriend loved it. Good quality and cheap considering how nice it is. I bought this watch for my boyfriend for Christmas. It arrived very quickly and which I was very impressed with. The packaging was in excellent condition and you could clearly see that whoever packed it does it with care. When I opened the box I was happy with box the watch was in which is a plastic case. The watch itself was better than what I expected. Ordering things online can sometimes disappoint you because they can look better online but I was extremely happy straight away. The face is a good size and theres not too much going on with the face which I like. The features and the logo on the face are just enough. If you like a simple watch with small simple features this is the watch for you. and its very good value for money and looks more expensive than what it is. Even though I liked the box, I thought maybe because it actually looks quite expensive then maybe the box should be in a leather box rather than plastic. Overall I am very happy with the watch and I know my boyfriend will love it. I feel its perfect for all ages and perfect for a Christmas or birthday present. This watch is fantastic, for someone that wants a smart watch that you can wear casually or smart. It works either way and for the price you cannot complain. Its comfortable to wear too. Only one issue i have, it does not illuminate at night in the dark which is a facility i would have loved to have had. I was amaze when I got the product itself. The delivery was superfast like I ordered on monday and I got it the next day itself tuesday early in the morning. The service was really excellent. Regarding the watch, Im very satisfied with it. It is all I wanted. I bought it for my boyfriends early Christmas present. He love the watch as much as I did. Im very satisfied with this purchase. The price was really reasonable with the AX engraved features. Very affordable. I spent quite a while looking for a watch that suits my boyfriend since he is tall and skinny. I recommend this watch for anyone. Even though the watch itself is quite big but it is balance with the strap. I highly recommend this watch if you want to buy it for your family, boyfriend or even friends and if youre not sure which one to choose, this should be the one. I know my boyfriend love it so much. Purchased this for my sons 29th birthday - he is delighted with it although it is bigger then I thought it was! Lovely watch,well made and in a nice case. bought as a Christmas present for my partner. Beautiful watch for a good price. Bought this for my boyfriend for Christmas I hope he likes it! Looks very smart. The acctual face its self looks quite large so maybe look at measurements before buying! Comes in a lovely gift packaging too! Comfortable to wear and an ease to tell then time. Good colour lets it go with anything. Good value for money. 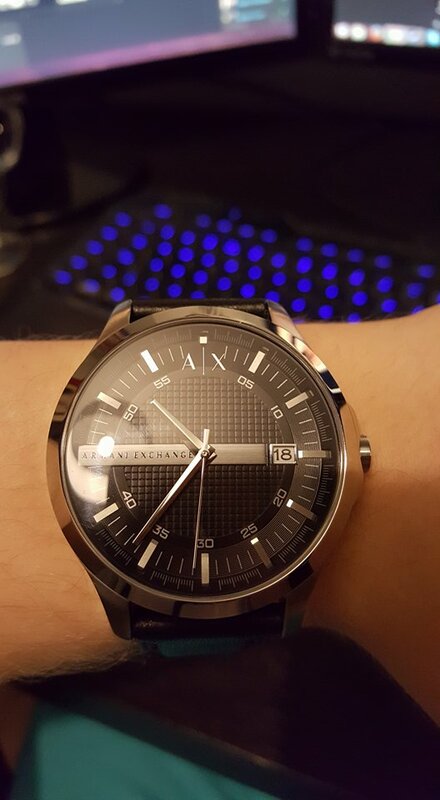 I like armani exchange watch,looks smart and classic.I bought for my birthday and iam very happy.and size of watch is perfect how i wanted. This product was exactly what I expected and I was very pleased. The watch has a big face with the date on as well which looks great and I cannot fault it. The big face with the black background and black leather straps gives it a smart look which looks great on anyone. I would 100% recommend this watch to anyone at all, and it is a lovely watch for a brilliant price. Bought as a gift. He was extremely pleased with the watch and loved the big face. Looks good on your wrist when you wear it. Very happy with this purchase, watch looks great, fits great and a very reasonable cost. top marks for the product and also the next day delivery. The watch is stylish yet smart, ideal for work. The design of the watch is very classy. Goes with any outfit i wear whether it be formal, casual or sporty. Printed A|X on the inside strap, clasp and battery hold. The cons of this is the inside of the leather, it is white, which gets quite dirty but its un-noticeable so its completely fine. Maybe stiff and tight at first but it loosens up with abit of heat from a convecter heater. Overall i couldnt have asked for a better watch. Excellent watch for a reality good price. I bought this as a gift for my brothers 30th birthday and he was really pleased with the watch. The face is quiet large so probably wouldnt suit a small wrist. The delivery service was excellent and very fast and came on time before 1pm. Excellent service and gift. GoOd website with great varety and great prices.presentation was delivered in nice box, right in time and at a very reasonable price. The watch is bold with a black leather strap. The style is simple dial isnt confusing and attractive. The strap has multiple holes to fit most wrists. I bought this watch for my boyfriend for his birthday. And I couldnt of thought of a nicer watch to get him which is a designer at this price! The leather on the watch is very good and also the watch face itself is very sleek and looks very expensive! It also came In a box which looks expensive in its self, let alone the watch! Overall I would recommend this watch for anyone as it is cheap for a designer watch but looks well over £300!! I was very happy with it. Great purchase, wearable in every situation slightly bigger than you might think but still extremely happy with the watch. Very nice and elegent watch,perfect gift for my son,who is 15.watch is very good and nice material and good size for a young wrist.definetly recomend for all. Im really satisfied with the product and customer service provided by watchshop. The watch arrived in 24 hours, originally packed with certificate. The watch itself is fully according to my wishes and expectations. Bf loved it very very much! Came in a beautiful box too. The leather strap quite hard though, not one of those soft leathers but its not a problem at all. The watch look really great. The black color of the watch belt really suit with it main surface. It look cool on young man. My fiancee really love it and he said it look simple but stylish. Order was shipped the same day and arrived very fast. Was a lovely and very elegant watch for a very love price !! This was purchased as a gift. Recipient was delighted. The service provided by The Watch Shop is second to none. I bought this watch for my leaving manager as a present. Well, it is spectacular, elegant watch for any occasions. Looks amazing on a wrist. Im thinking to buy one for myself. I wasnt particularly looking for Armani Exchange but this one caught my eye. If youre looking for a value watch as a present, this could be the one. I ordered with gift wrapping. Well I though luxury gift wrapping would be real luxury. Wrapping isnt that important, it ends in the bin anyway. A lovely watch that looks far more prestigious than its price suggests. Had lots of positive comments which took me by surprise. I bought this product as a gift for my boyfriends birthday, he loved it it was a perfect fit and looked so expensive and classy. I would recommend this product to anyone looking for a great present or just to wear themselves its genuinely beautiful. Delivery was fast, loved the presentation box it came in. The attention to detail on the watch surprised me, has little logos all over the watch and straps. Very good product, simple, sleek and effective. People may say the face is big but I think its perfect, cant have a small face for a big lad like me. Beautiful watch, the leather strap is a bit too stiff. I think a more flexible leather strap would have made it a perfect watch. But other than that it well worth your money. Perfect. Even nicer in person, quite a large face of the watch, but thats what I wanted. Really quick delivery, ordered on the Sunday, got it on Tuesday. All in all a great product at a fantastic price! The watch was a lovely gift for my brothers graduation! he loves it!!! Delivery time was on point too!!!! Looks really sleek and smart. Perfect size of watch, not too small, not too big and chunky. Adjustable strap means it will fit anyone. Really fast delivery, ordered on the tuesday and received it thursday morning, plus delivery was free so what more could you want? We bought this for our sons 21st birthday. It is a simple but very stylish watch. Some people may find the watch face a little large but it really suits my son. Stylish looking watch for fashion conscious 17 year old. Looks worth a lot more than £88. The watch is great quality and Im very happy with my purchase due to the bargain price. Its a perfect size, not to big, not too small, its very elgagant and manly. Also it is a great gift for someone who doesnt like a lot of bling as its pretty plain but less is more in this case. My boyfriend loved it so all in all a great gift. Looks very stylish yet sophisticated, goes with pretty much anything I wear. The silver face and black straps go well together. Worth every every penny. This is elegant watch. The watch is big and best suited for someone with big wrists. Nice leather strap. This is my second purchase from Watchshop. First for my wife, and this time for myself. Like the first time, Watchshop did not disappoint me. My elegant watch arrived earlier than I expected. 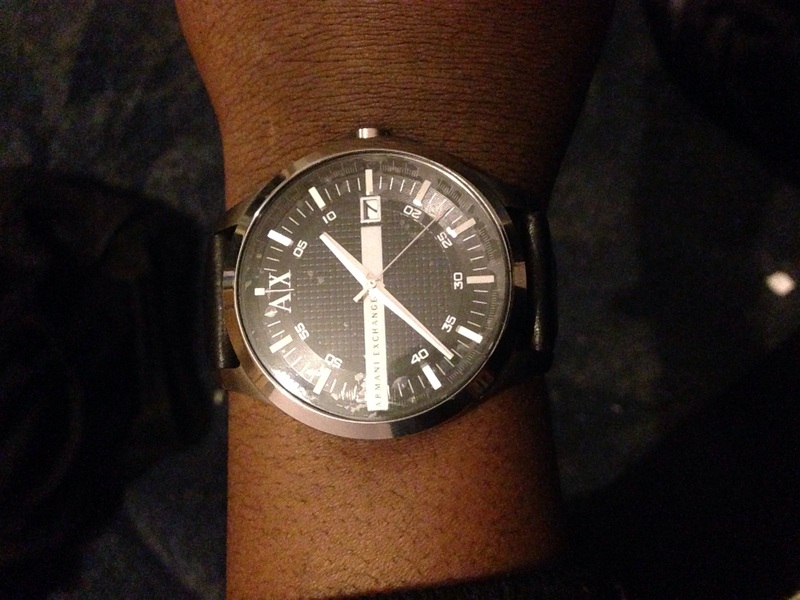 As a gift to myself, I am absolutely satisfied with this Armani Exchange watch. Gorgeous packaging, gorgeous watch, excellent service from Watchshop, lifes really good! 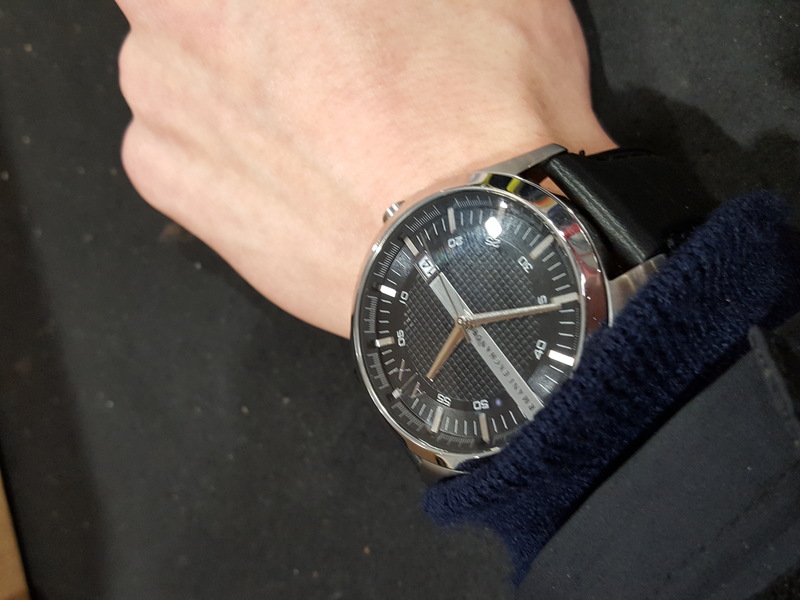 Bought as a gift for my boyfriend who usually wears metal strap watches but thought as it was his 22nd birthday Id buy him something classy he could keep for a long time! This watch is classic, timeless and really sleek. Its not too much unlike other designer watches its not over the top. The big face and the lighter metal strip makes it really eye catching though. Its simple and stylish... A real gentlemans watch. Looks just as good with jeans as it does with a suit! 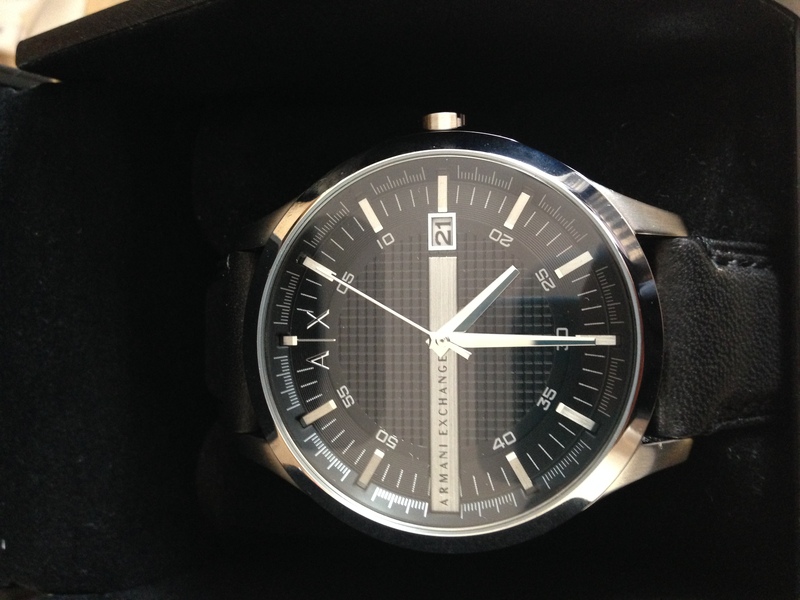 The Armani Exchange watch is great, superior quality, fantastic design and great price! This watch will be a great gift idea, price is extremely reasonable, will fit all hand sizes, a criticism is that the face of the watch is a bit big, but that doesnt bother me. 9/10 for this product. I think this colour is the best one to get if youre not looking for something too flashy. THE WATCH WAS FOR MY SONS 18TH. HE LOVED IT. iT WAS EXCELLENT VALUE FOR MONEY AND LOOKS VERY STYLISH WITH ITS SIMPLY DESIGN. LOOKS CLASSY. ITS A WATCH TO BE WORN FOR ANY OCCASION. 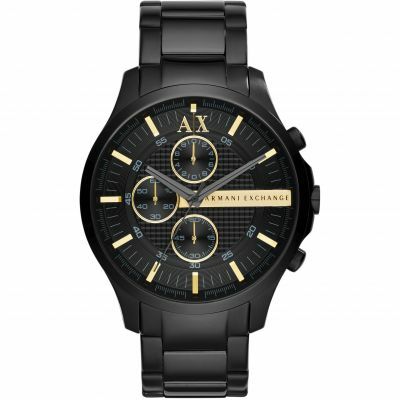 I spent a few days contemplating which of the Armani Exchange range of watches to get but I am extremely glad I opted for this amazing watch as it met my criteria perfectly. If you are thinking to purchase this watch for a friend, relative or yourself, you will not be disappointed as it is excellent value for money. Overall, I am a very satisfied customer, love the watch, highly recommend Watch Shop and I will definitely be purchasing from the Watch Shop again in the future. Excellent value for money, looks even more expensive on.it came beautifully packaged and excellent condition! I brought the watch for my friend and is very nice, elegant and sleek however, I thought the face of the watch would be abit smaller. 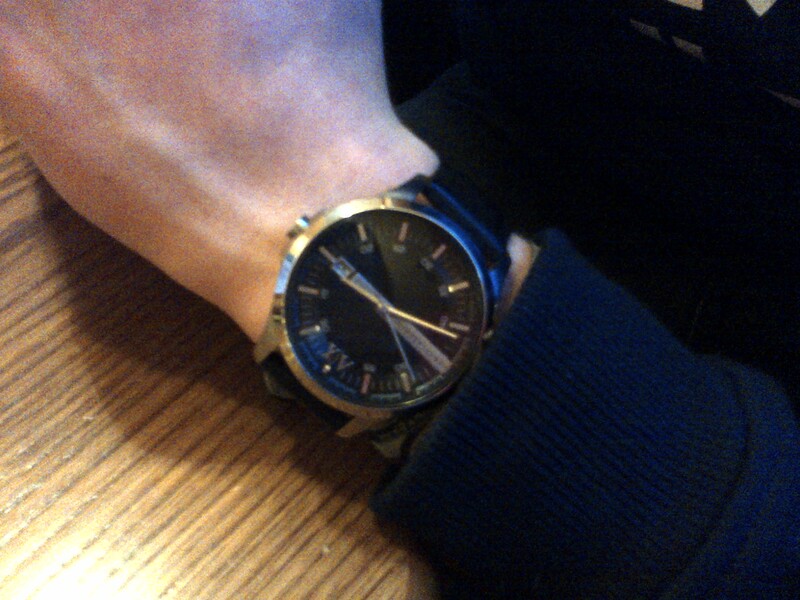 Although the watch does look great and suits my friend perfectly! Bought this watch for my brothers 21st birthday and he absolutely loves it! Amazing quality and looks really stylish!! Cannot fault it!! Very good I love it it fits perfectly and looks great. It isnt to big and the leather strap was definitely the right choice when compared to the other straps. It isnt too over the top and so can be worn for any occasion I even wear it for school! Watch a gift for my husband he loves it! Would definitely use watch shop again, watch was well packaged ideal gift also prompt service. Thank you! The product was in v.good shape and was exactly as photgraphed. However I would of liked more of a detailed manual for the actual watch I purchased, as the one they gave was extremely brief on the actual model. very nice watch, classy. the clock may seem a bit big but with time easy to get used to. Great product, looks exactly like the image shown and did not disappoint. Quality of watch is high and comes in great gift box and packaging. Could not be happier with this purchase! Best buy ever. My son absolutely loved it and its best value for money. Gives him that elegant look and he looks so grown up with that watch. We love it. Excellent value for money, looks even more expensive on. Bought as a gift and he was very pleased. 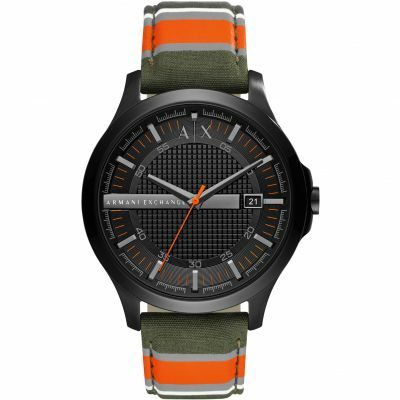 I really love the look of this watch its stylish well worth the money got it for my boyfriend for Christmas the face is big but not too big it works well together really good affordable gift. 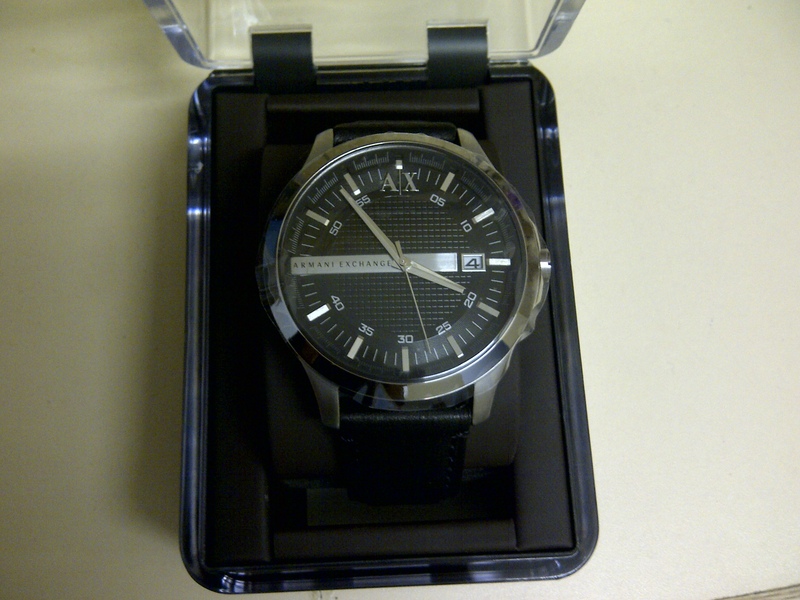 I ordered a black Armani watch it came beautifully packaged and Im excellent condition! Just bought this watch for my boyfriend and it looks so expensive! I was worried as i hadnt used this site before what the packaging would be like, but it comes in an clear armani exchange box, again expensive looking. The watch is just how it looks on the site and i cannot wait to give it to him! It is black colour with a royal look which suits for both the casual and office wear as well. This is really nice. I bought it to gift someone. I am sure it will be liked a lot. Nice pattern, will go very well for formals or casuals. Very nice watch, great value for money. Looks very sleek with black face and strap and silver detail. The product is exactly like the picture, it works and has no scratches. I like the size of the product, and there isnt anything i dont like. I like the leather strap and the fact that you know it is armani just by the logo on the face of the watch. I would definitely shop with watch shop again and the service was excellent. I personally liked the color combination black dial and silver body. However i feel that case width 47mm is quite big for my hands. I am glad that AX came up with a leather strap and not with a metallic one as I always prefer the former one. 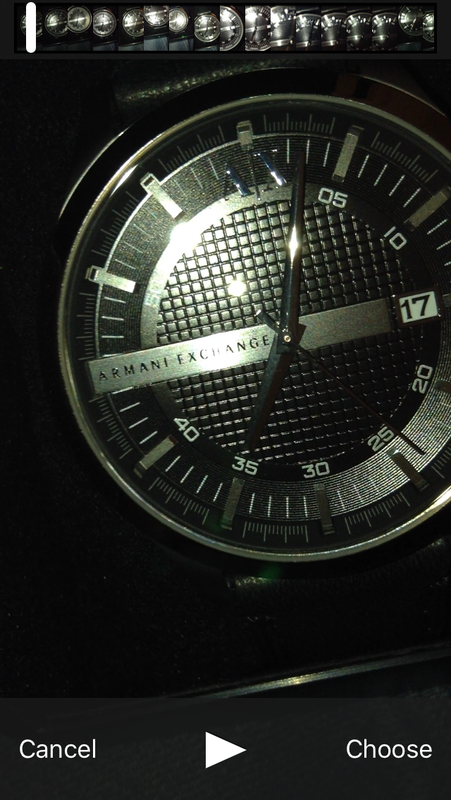 In addition, engraving the words Armani Exchange inside the dial is a pleasure to watch. The other feature I honestly admire is the presence of squares on the dial and with AX chiseled on the wheel used to adjust the date & time depicts the image of the brand. Overall I like the watch and I definitely do not recommend to someone whose wrists are small. Guys with fairly big wrists just go for it and its quite cheaper as well.. Very happy about this watch. I am a fan of the larger faced watch, this one is not massive but just right in my opinion. The face itself is very clean and not too noisy with dials, and has a very classy look to it. The watch also has a nice weight to it, not cheap and light but feels good on the wrist. Leather straps are very low key, simple black leather. Overall for the price of under £100, this is an ideal everday watch for me and works well in the office and out. The watches is a bit large itself, but overall looks fine. My advise - check watches dimensions before you buy and try to compare with the one you already have.